The following is a guest post from Olivia Dello Buono, Social Media Specialist at AWeber. AWeber is one of the world’s leading email marketing providers, helping more than 100,000 businesses, entrepreneurs and bloggers increase sales and profits through its suite of web-based email marketing software. Catch their #EmailChat the first Thursday of every month at noon ET. User-generated content (UGC) is a fresh, relevant way to market your products and services. And while the concept might not be new, the ways that marketers are leveraging UGC totally are. Since holiday planning season is in full swing, it’s time to look at just how impactful customer content can be – and how you can steal these ideas for your next email campaign. Consumers are now content creators, uploading and sharing images of their favorite products and services as a testament to their brand loyalty. And the sheer volume of digital content has grown exponentially thanks to platforms like Instagram and YouTube that encourage social sharing. But UGC isn’t advertising, it’s a conversation. People don’t feel like they’re being sold to and that’s what makes it so powerful. Social media can help brands forecast the next big trends and topics. And when you use it to find content for your emails, you stay relevant in the conversation. And it’s great for event marketing, too. 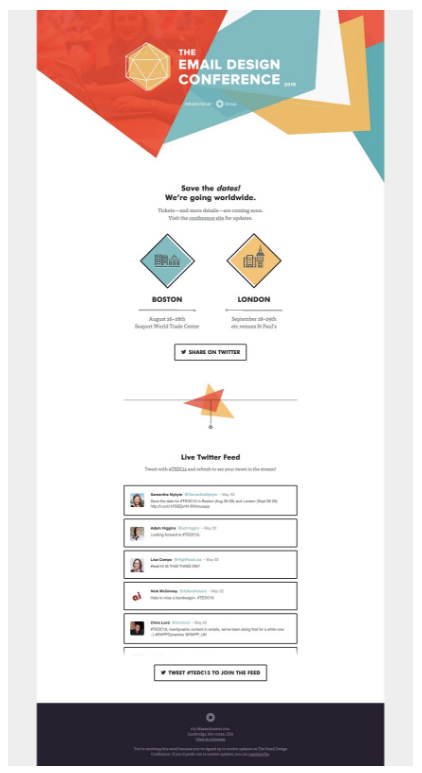 We love how Litmus used a live Twitter feed in this email to promote the Email Design Conference. Seeing what other people in the space were tweeting about really helped build credibility and interest in the event. How many times have you purchased a product after hearing a tv or radio spot? Probably not too often. But how many times have you made a purchase after hearing a raving review from someone you know and trust? Exactly. Brands are no longer what brands say they are – brands are what people say they are. Consumers now turn to crowdsourcing before they splurge. 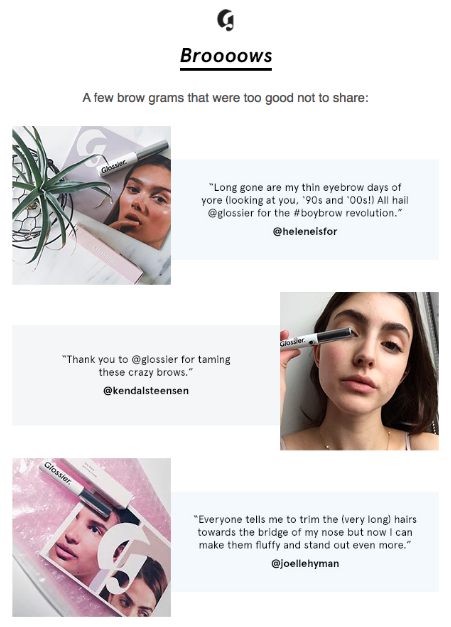 Beauty startup Glossier relies heavily on word-of-mouth and user-generated content to drive their marketing strategy. Everything from their cool girl vibe to Instagram-worthy packaging were designed to encourage social sharing – and it totally works. Even their emails link out to their different social channels, where they routinely retweet and share fan content. Take a cue from their approach and encourage your customers to get in on the conversation. Are people raving about your brand on social media? That’s literally all you need for a really good email (with the exception of a CTA). Round up your best customer testimonials, quotes, and images and feature them in your next email. A unique hashtag for your brand helps, too. Unlike, say, the produce at Whole Foods, organic equates to free in the digital marketing world. People are talking about your brand for free. Email has already built a solid reputation for being one of the most cost-efficient marketing channels, with an ROI of 43:1. 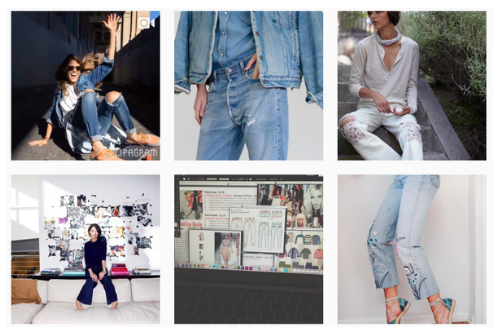 Adding user-generated content to the mix boosts your sales even further: UGC campaigns have proven to be 20% more influential on purchasing decisions than other types of media. Talk about a power couple. 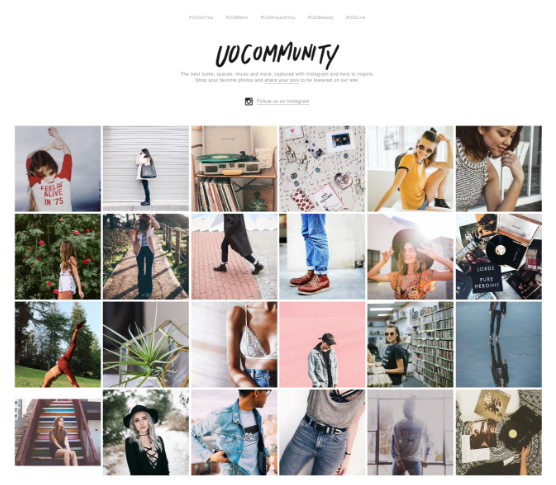 User-generated content is one of the most effective ways to find and build a community around your brand, especially among the Millennial crowd. There are hundreds, thousands, millions of online communities that already exist. The power is in the social proof. Use user-generated content to show your subscribers what products are hot right now. Integrating a social feed in your emails is not only really cool, it’s smart. Link out to your own stock and watch the sales pour in. Using relevant, socially-sourced content can help build community, boost engagement and drive sales. And it’s one of the best ways to stand out in a crowded inbox. This entry was posted in Email Marketing and tagged email content, UGC, user-generated content on October 4, 2016 by Kristen Dunleavy.